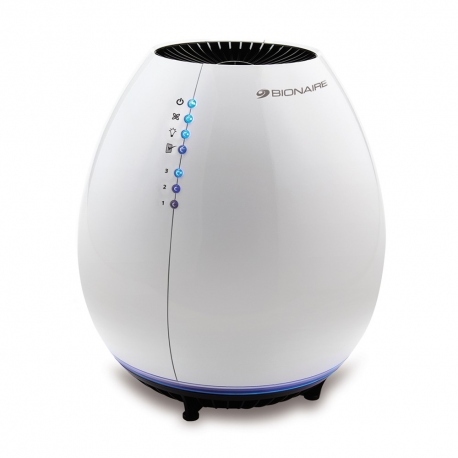 Bionaire BAP600 Air Purifier with Permanent Filter. Digital Touch Button Controls with LED lights. Built-in Ionizer enhances particle filtration. Permanent Filter never needs replacement. Filter Monitor with Indicator Lights. 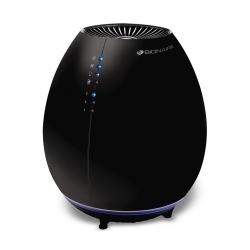 Permanent HEPA type filter traps 99% of all allergens and dust down to 2.0 micron in size. Washable pre-filter extends the period between the HEPA type filter cleaning. Clean Air Delivery Rate (CADR): Dust - 80 CFM, Pollen - 76 CFM, Tobacco Smoke - 72 CFM. Level of Noise per Speed: Low - 35 dB, Medium - 50 dB, High - 57 dB. Maximum cleaning area - 340 sq. ft. @ 2 air changes per hour. Recommended cleaning area - 112 sq. ft. @ 6 air changes per hour. Power consumption: Low - 30, Medium - 50, High - 90 Watts. Convenient touch button Digital controls with LED lights. Built-in filter clean monitor with LED indicator light. Soft blue nightlight provides soothing and comfort illumination. Bionaire BAP600 employs permanent HEPA type filter. Maximum cleaning area sq. ft. 340 s. f.
Recommended cleaning area, sq. ft. 112 s. f.